Cardinal Vincent spoke at the Marriage Care Annual Conference, which took place in Daventry on 13 September 2014. In his address, the Cardinal recognised the work of the charity since its inception at the end of the Second World War in helping couples and families. Tomorrow, Pope Francis will preside at the marriages of 20 couples in St Peter’s Basilica. This will, without doubt, be an extraordinary moment for these 40 men and women, a moment which is both special to them personally and to their families but also iconic of the unique place that marriage holds as one of the seven sacraments of the Catholic Church. In three weeks’ time, another extraordinary moment will take place; the Third Extraordinary General Synod of Bishops will begin in Rome. The Presidents of Bishops’ Conferences from around the world have been called by Pope Francis to come together to discuss the theme of the Synod: ‘The Pastoral challenges of the family in the context of evangelization’. As the President of the Catholic Bishops’ Conference of England and Wales, it is my privilege to represent the bishops of this country at the Synod. As you know, there has been much preparation for this Synod. Firstly there was the publication of the preparatory document, the Lineamenta, which set out in more detail the theme to be discussed at the Synod. Secondly, there was the worldwide consultation conducted by the Holy See to enable as many of the faithful as possible to have the opportunity to contribute to the work of the Synod. This consultation resulted in summary reports from 114 Bishops’ Conferences throughout the 5 continents of the world being sent to the Secretariat of the Synod. “…offers a broad, yet by no means exhaustive, perspective on the present-day situation of the family, on the challenges of the family and on the reflections to the family today”. These three stages of preparation, and most importantly the Synod itself, are the windows, as it were, that Pope Francis has created to look out upon how the Church’s teaching on marriage and family life is transmitted and received all over the world. “…intends to make it clear that the Church does not avoid challenges, but takes them on with full responsibility; he wants to move with the times, accompany people, share their joys and sorrows, listen to their hopes and sufferings, and he wants to do this with clarity, determination and truth”. However, the Synod this October (an Extraordinary General Assembly of the Synod of Bishops) will only be the conclusion of the first stage of this worldwide reflection on the pastoral care of marriage and family life. It will be the task of the Ordinary General Assembly in October 2015 to reflect on and continue the work of this October’s Synod so as to formulate appropriate pastoral guidelines for the pastoral care of marriage and family life for the future. “The family is experiencing a profound cultural crisis, as are all communities and social bonds. In the case of the family, the weakening of these bonds is particularly serious because the family is the fundamental cell of society, where we learn to live with others despite our differences and to belong to one another; it is also the place where parents pass on the faith to their children. Marriage now tends to be viewed as a form of mere emotional satisfaction that can be constructed in any way or modified at will. But the indispensable contribution of marriage to society transcends the feelings and momentary needs of the couple… it is not born of loving sentiment, ephemeral by definition, but from the depth of the obligation assumed by the spouses who accept to enter a total communion of life”. The support which the Church can give to families experiencing difficulty in relationships, particularly in regard to the break-up and breakdown of marriages and family life. That opportunity for pastoral ministry - to promote effective pastoral strategies to strengthen marriage and family life in each diocese - is one that the Catholic Bishops’ Conference of England and Wales had already identified as one of its key strategic priorities. The development of a common evaluation tool so that the particular impact of the different programmes in use can be better understood. I was very grateful therefore for the presentation which your Chief Executive, Mark Molden, gave to the Bishops during their Spring Plenary Assembly earlier this year. That presentation represented an important step in restoring and strengthening the relationship of Marriage Care with the Bishops’ Conference. For it is my hope as your President, and the hope of the Bishops, that Marriage Care, as a Catholic foundation, will not only want to continue to play a role but will seek to develop an even greater part in the delivery of marriage preparation for the Catholic Church in England and Wales. Here, the results from the consultation in preparation for the Synod have reaffirmed Pope Francis’ desire not to avoid challenges. The reality of the critical situations which develop within marriages and families, their break-up and break down, the violence and abuse are clearly acknowledged. The importance of mercy as the path to reconciliation and forgiveness in human relationships and in relationships with the Church will be, I believe, an important and recurring theme in the reflections of the Extraordinary Synod. Although initial support by the Church for family relationships originates in a parish, other organisations can also play a significant role in collaborating with, and strengthening, that support. Here again, Marriage Care could be well placed to play a significant role. It is important for this collaboration though, that the marriage preparation and the support for family relationships which Marriage Care provides is not only inspired by the teaching of the Catholic Church but is also faithful to it in all aspects. One reason for this is the rich and coherent vision of the human person which is made known in the person of Jesus Christ and proclaimed in the teaching of the Church. It is also the absence of that vision from much of our society which lies at the heart of the challenges we are facing and has resulted in the isolation and privatisation of much family life today. Without doubt, the results from the consultation in preparation for the Synod describe the very real pastoral situations in which many couples are living prior to making a commitment to each other in marriage. Notwithstanding therefore the contemporary reality of such relationships and situations in which many couples present themselves for marriage in the Catholic Church, the marriage preparation which we seek to give [must provide not only a strengthening of the human dimensions of the marriage relationship but also its faith dimension both in its inner nature as a reflection of the mystery of Christ and his Church, and in the family’s vocation of faithful and continuing witness to Christ in contemporary society. ]* Such preparation requires an integrated approach involving clergy, parish volunteers, diocesan programmes and other organisations. The Church must also keep foremost in view that any renewal of its pastoral actions in support of the family should also give priority to the needs of children and to the vocation of parenting. Preparation for parenting and support for parents who often experience very great strain in bringing up their children are areas which need to be significantly strengthened within the Church. Again, the experience and history of Marriage Care in these areas have much to offer. Dating back to the years after the Second World War, Marriage Care has a proud history of supporting families in the Catholic community whose lives and relationships came under the stress which that conflict wreaked on so many men, women and their children. I am conscious of, and wish to pay tribute to, the large network of Catholic volunteers from parishes across England and Wales that has been built up since those early years and see their work within Marriage Care as a real contribution to the life and mission of the Church. I am aware too of, and similarly wish to pay tribute to, the generosity and dedication of many Marriage Care members who, though not members of the Catholic Church nevertheless share its commitment to support marriage and family life. The expertise that has been established within the volunteer workforce which supports Marriage Care is considerable and represents an extensive resource for the work of marriage preparation and the care of family relationships. I welcome therefore the links and collaboration which I know have been forged both at a national and local level between Marriage Care volunteers and centres with diocesan and local Marriage and Family Life Coordinators. To provide the marriage preparation and the relationships care which is needed, it is essential that we share a common understanding about what constitutes marriage and what principles govern the care of the family relationships it encompasses. It is my hope that those links and collaboration can be strengthened. Clearly, the core mission and work of Marriage Care as a charitable organisation is to be found in its name, whether its official name of ‘Catholic Marriage Care Ltd’ or in its abbreviate form and operating title of ‘Marriage Care’. Its charitable objects state that all of Marriage Care’s services are to “promote and support marriage and family life in accordance with the Church’s vision of marriage as a vocation of life and love”. What I hope therefore will always be seen clearly to be at the heart of Marriage Care’s vision and enterprise, is the care for marriage, both as an institution as understood by the Catholic Church and for the couples which literally embody that institution. In your Chief Executive’s speech to the Marriage Care Annual Conference in 2013, Mark said, “I have a real sense that this year ahead is going to be quite an exciting ride!” Well, Mark, with the preparation which he initiated and for the Synod of Bishops which he has called, I think Pope Francis is certainly giving us all an exciting ride! I began by speaking of an iconic moment - the marriage ceremony of the 20 couples in Rome tomorrow. 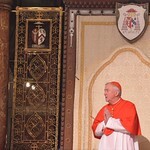 Last Monday, another icon of the family was revealed; the icon which is to be the central image for reflection at the World Meeting of Families in Philadelphia in 2015. The icon depicts the Holy Family. Within the icon though, it is not only the infant Jesus, the Blessed Virgin Mary and St Joseph who are portrayed but standing behind and close to them are St Anne and St Joachim, the mother and father of Mary and the grandparents of Jesus. In June, at a Mass celebrating the wedding anniversaries of 15 couples, Pope Francis spoke in his homily about the three pillars of spousal relationship in the Christian vision of marriage: fidelity, perseverance, fruitfulness. The icon reminds us that when we contemplate Christian marriage, we recognise that its true fidelity, perseverance and fruitfulness is generated by the presence of Almighty God, and is supported by an extended family of grandparents, relatives and friends.